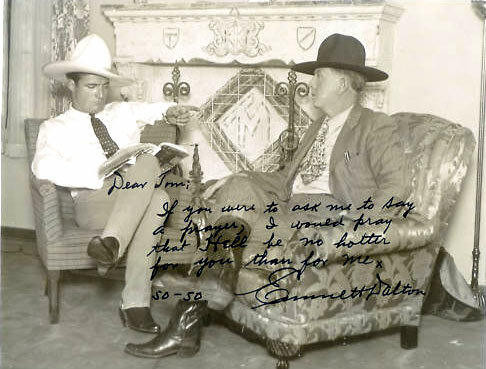 Johnny Mack Brown. August 1945. 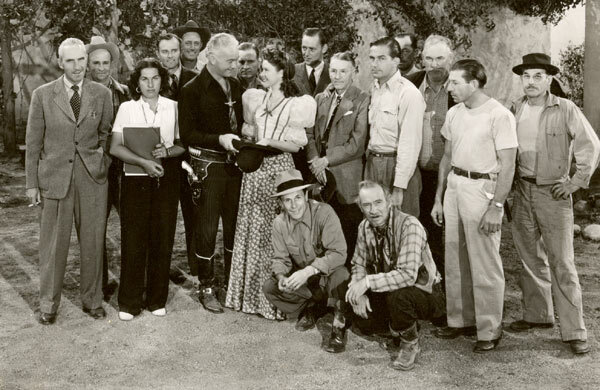 Partial cast and crew for the Hopalong Cassidy western “Bar 20” (‘43). 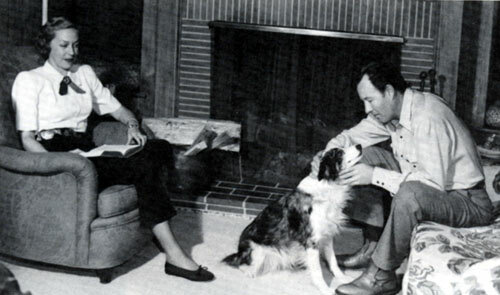 That's Hoppy with leading lady Dustine Farnum (daughter of Dustin Farnum) and of course Andy Clyde kneeling in front. Rest of the group is unidentified. Can anyone help with any IDs? Buck Jones has a little poolside fun with leading lady Ruth Coleman between takes of “Headin’East” (‘37). 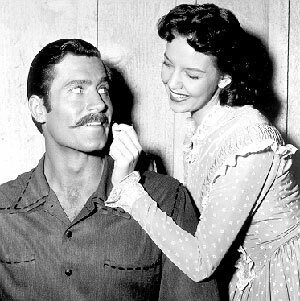 Clint Walker and Sally Fraser clown around on the set of “Cheyenne: The Trap” (‘56). 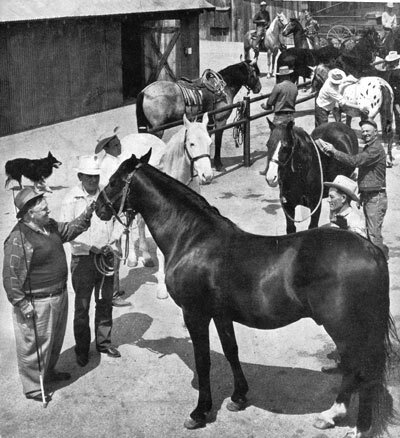 A view of Ace Hudkins’stables near Warner Bros. Hudkins brothers began renting horses to film companies in the late ‘30s. 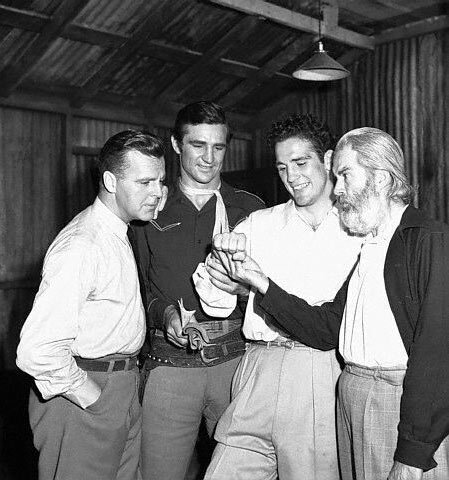 Light Heavyweight boxing champion Billy Conn, known as The Pittburgh Kid, lets Neil Hamilton, Sammy Baugh and Gabby Hayes take a look as his strong right hand during the making of the Republic serial “King of the Texas Rangers” in July 1941. 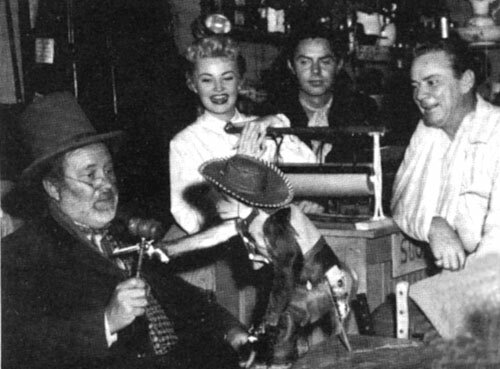 Monkeying around on the “Judge Roy Bean” set during the filming of the “Citizen Romeo” episode regarding a organ grinder’s monkey are (L-R) Edgar Buchanan as Judge Roy Bean, Jackie Loughery as Letty Bean, Jack Beutel as Jeff Taggard and producer Russell Hayden (who often played Texas Ranger Steve). (L-R) Clint Walker (“Cheyenne”), Richard Simmons (“Sgt. 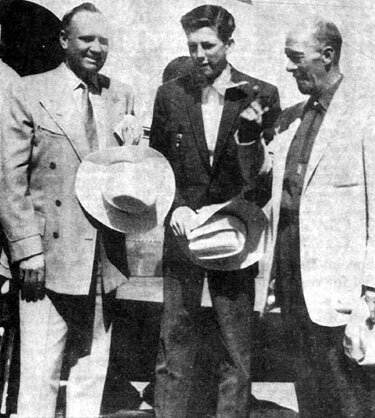 Preston”), Walt Disney (in center holding small case), Tom Tryon (“Texas John Slaughter”), Henry Calvin (Sgt. 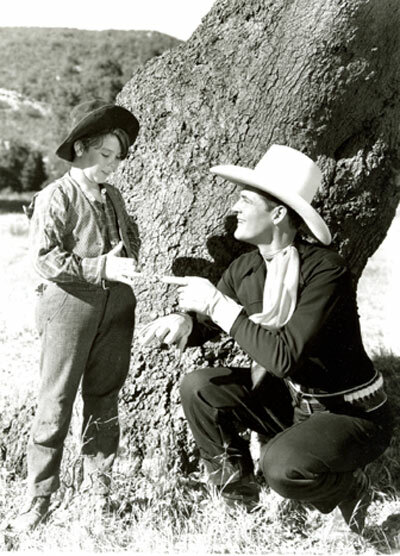 Garcia on “Zorro”), Edd Byrnes (“77 Sunset Strip”), Hugh O’Brian (“Wyatt Earp”). 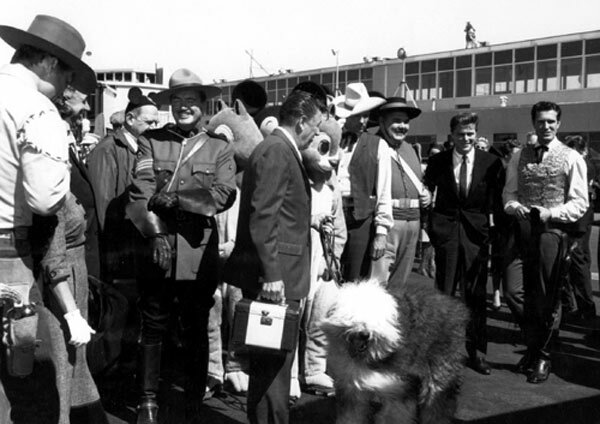 Not sure of the event, but judging from The Shaggy Dog obviously a 1959 promotion for the Disney movie. 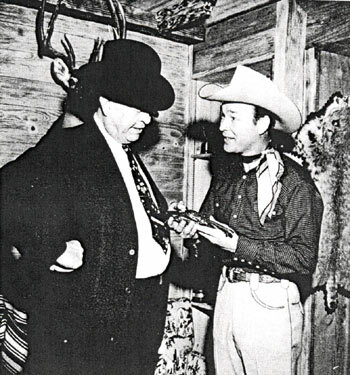 Legendary Captain Frank Hamer of the Texas Rangers and Roy Rogers examine a pistol at Roy’s home. Hamer and others ambushed the notorious Bonnie and Clyde near Gibsland, LA, on May 23, 1934. 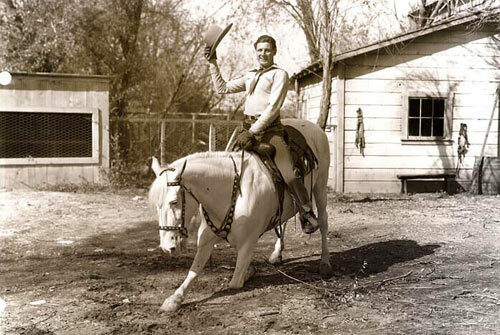 William S. Hart and Fritz, March 1924. 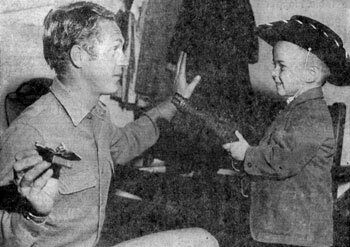 Five year old Randy Cooper of Albuquerque covers Steve McQueen of “Wanted Dead or Alive” with McQueen’s own “mare’s laig” (a cut down version of a Model 92 Winchester 44-40 rifle). 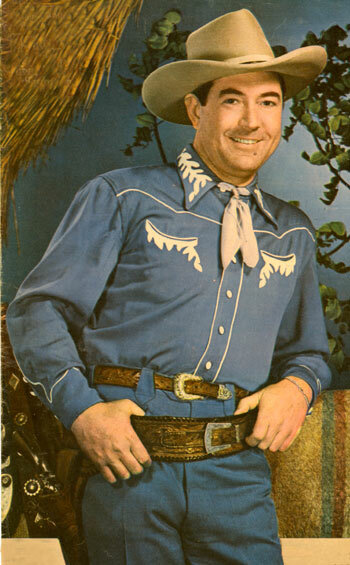 McQueen was appearing at the New Mexico State Fair in October 1959. Cooper presented McQueen with a western bolo tie with a big chuck of turquoise on the slider. 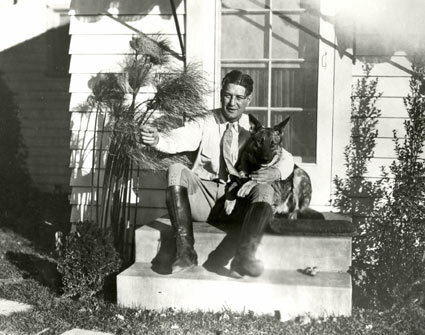 One of the top silent screen cowboys, Art Acord, at home with his dog. Circa late ‘20s. 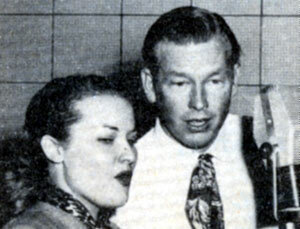 Patti Page and Rex Allen recording “Broken Down Merry-Go-Round” for Mercury Records in 1950. 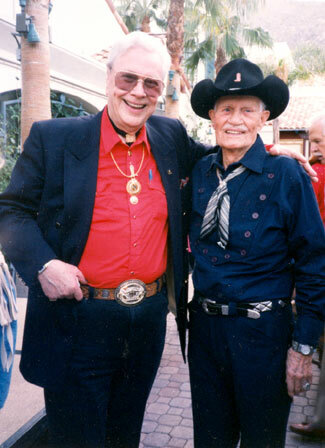 Monte Hale and badman Pierce Lyden pose for a moment at a Palm Springs event. 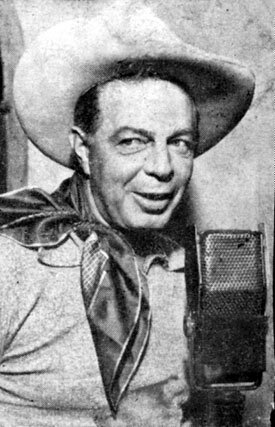 Hoot Gibson steps before a microphone in the mid ‘40s. 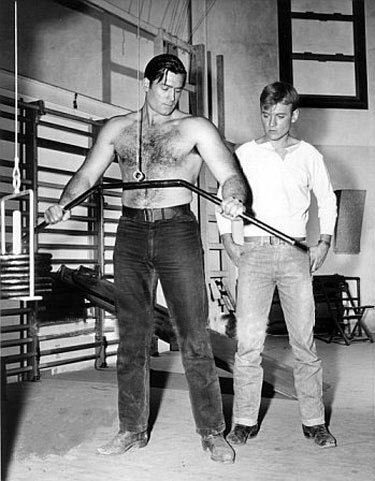 Will (“Sugarfoot”) Hutchins watches as Clint (“Cheyenne”) Walker works out in the Warner Bros. gym. (1906-- )waves upon her return to San Francisco from a Honolulu vacation on June 26, 1930. Barbara was the leading lady in “Prowlers of the Night” (‘26) with Fred Humes, “No Man's Law” (‘27) with Rex the Wonder Horse and “Freighters of Destiny” (‘32) with Tom Keene. 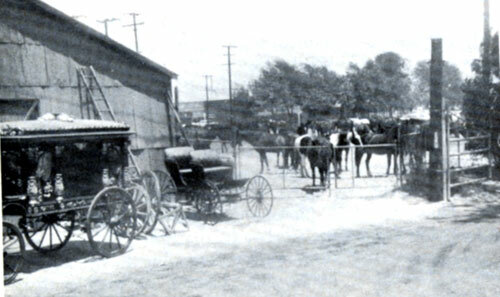 The later cast of “Wagon Train” gather around Frank McGrath’s Wooster-Wagon on the Universal back lot. 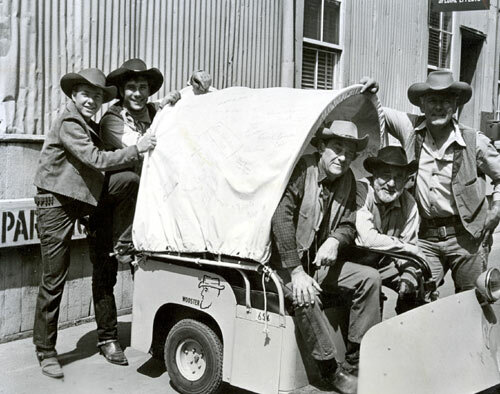 (L-R) Michael Burns, Robert Fuller, John McIntire, Frank McGrath (as Charlie Wooster) and Terry Wilson. You probably can’t read them in this photo but the wagon tarp is covered with autographs. 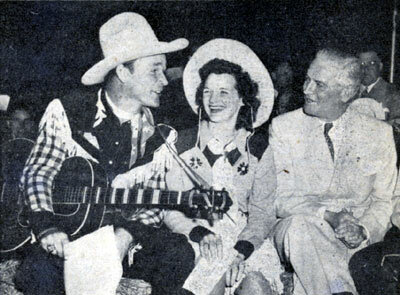 (L-R) Roy Rogers, Patsy Montana and Republican Governor of Illinois from 1941-1948 Dwight H. Green. 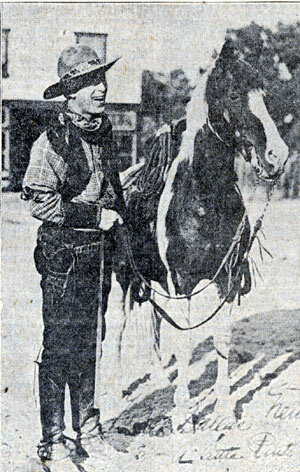 Roy was guesting on the WLS National Barn Dance when this picture was taken. 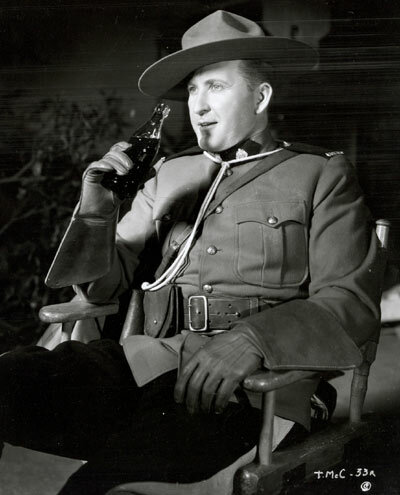 And now, to wind this page up, let’s enjoy the pause that refreshes as Tim McCoy sips a Coke during a break from the filming of “Fighting Shadows” (‘35 Columbia).